Apparently its a tradition of Switchback Road for all the neighbours to secretly celebrate 70th birthdays with a special display. We have heard of 70 ribbons, 70 balloons, 70 pink flamingos, etc. This tradition held true for George’s 70th birthday in December! I was dashing out the door early in the morning for my volunteer work at the Food Bank (well, early for us at this time of the year!) 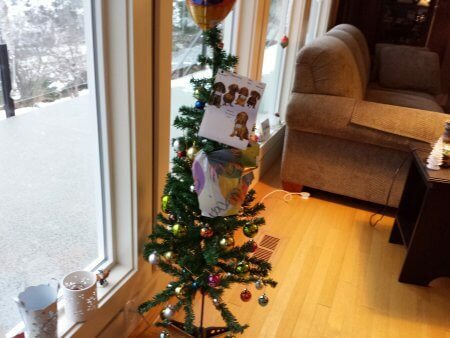 and almost fell over a little plastic Christmas tree all decorated with birthday wishes! It came into the house and has had a place of honor throughout our Christmas festivities – all 70 balls and birthday greetings, as its creators have assured us! Apparently it was placed in the dead of the night, but on the wrong night! It had to be retrieved, again in the night, and put back on our doorstep again, on the correct night. Now that’s dedication! Thank you neighbours! You continue to remind us how blessed we are to live on this street in the beautiful Okanagan.